This map shows firefly observations. 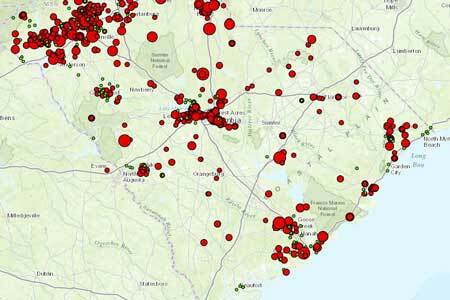 GEORGETOWN, S.C. – Results from the 2013 firefly count are in. There’s a steady glow in many parts of the state, but conservation efforts are needed, say Clemson firefly project researchers. The Clemson University Vanishing Firefly Project was launched by entomologist Juang-Horng “JC” Chong and biogeochemist Alex Chow. The goal of the program is to collect data over several years from different habitats across South Carolina and other states to determine the population trend of fireflies. Fireflies are fewer and harder to find in some communities along the coast lately because of urban development and changes in forestry practices. Next year, say researchers, the project looks to add an Android smartphone app, expand the survey to others states, maybe other countries, and recruit more citizen-scientists.